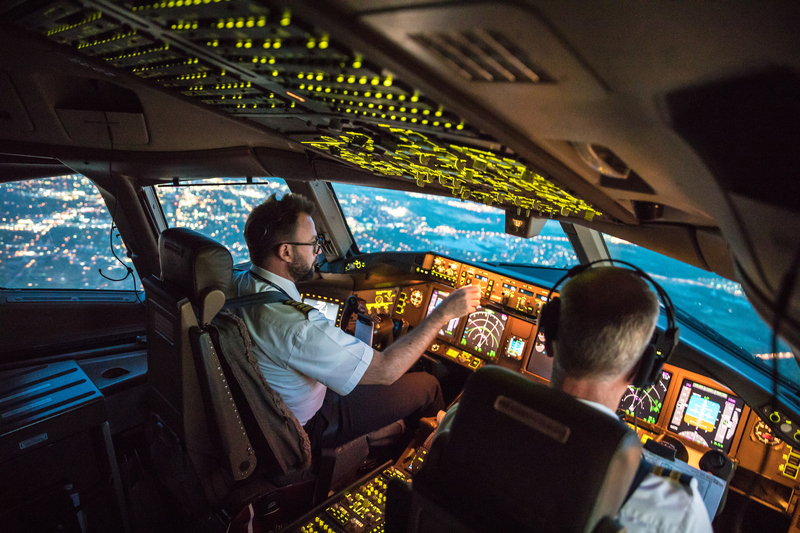 Boeing forecasts 558,000 new pilot jobs worldwide by the year 2034. Along with the increased pilot hiring, the company anticipates a need for 609,000 maintenance technicians*. The Bachelor of Science in Aeronautics (BSA) degree is designed specifically for students who work, have worked, or desire to work in aviation-related careers. For students with existing aviation-related knowledge and skills, this degree acknowledges a student's valuable acquired experience through the award of advanced standing prior-learning credit. The curriculum then builds on those skills and knowledge. The program also provides an opportunity for those students new to aviation to acquire aviation-specific knowledge through aviation-related coursework. The aviation industry knows about and respects Embry-Riddle Aeronautical University and our graduates, whether for positions as pilots, air traffic management, meteorology, safety, business, or Unmanned Aircraft Systems. The Bureau of Labor Statistics reports that employment categories in support of air transportation are expected to grow by 25 percent through 2022. Students pursue a variety of co-ops and internships with airline, aviation, and air transportation companies focused on safety, training, operations, dispatch, and transportation. Learn more about our Career Services Resources. Embry-Riddle is accredited by the Southern Association of Colleges and Schools Commission on Colleges. BSA students can minor in a range of specialties, depending on their campus affiliation like Unmanned Aircraft System, Aviation Maintenance and Air traffic Control. See our list of Minors according to campus. *Read more about Boeing’s predictions in the article “Demand unprecedented for pilots and technicians" on the company’s website. As Asia's aeronautics industry continues to grow, so do job opportunities in the field. But just what exactly is aeronautics? Basically, it can be defined as the science of flight. Designing an airplane or other type of flying machine, manufacturing them, operating them, maintaining them. It all falls under aeronautics. That means you could be anything from a scientist to a technician to an engineer or pilot. No matter which type of aeronautics career you want, a good place to start is by getting your Bachelor of Science in Aeronautics (BSA). Awarded by Embry-Riddle Aeronautical University, offered by ERC Institute (ERCI), the 120-credit hour degree program offers courses in human factors, security, aviation safety, occupational safety and health, air traffic control, aircraft maintenance and aeronautical science. Several degree minors allow you to tailor your degree to your particular interests and career goals. This full-time or part-time program is offered in an intimate classroom setting where you get one-on-one attention from faculty members and the chance to interact with and learn from fellow students. The Engineering Fundamentals Track (EFT) in the Bachelor of Science in Aeronautics degree program is the first step to opening the door to continued engineering studies at an Embry-Riddle residential campus in the United States. Students in the EFT will receive the quality engineering instruction ERAU is known for without having to incur the full cost of pursuing a bachelor’s degree at a residential campus. Through the EFT, students gain practical design experience using basic models and simulations. Students also get a strong foundation in math and physics. Experienced faculty members provide plenty of first-hand knowledge and individual attention. Students also have the chance to work with fellow ERAU students throughout the program. The EFT is Embry-Riddle Aeronautical University's latest offering for aspiring engineering students who want world-class educational opportunities that meet their needs in new and innovative ways. At the end of the two-year program, the EFT gives the student the option to continue in the Bachelor of Science in Aeronautics degree in Singapore or transfer to an Embry-Riddle residential campus in the United States and complete one of the following Bachelor of Science in Engineering degrees: Aerospace Engineering, Civil Engineering, Computer Engineering, Computer Science, Electrical Engineering, Mechanical Engineering or Software Engineering. Most of the courses in the Engineering Fundamentals Track are only offered during the day so it is ideal for a full-time student. Courses are offered in an intimate classroom setting where you get one-on-one attention from faculty members and the chance to interact with and learn from fellow students. When taken as a part of the BSA degree, COIN 496 is a 3 credit hour course, and credit hours are approved by the Program Chair. Students wishing to pursue the flight minor as part of the BSA degree must meet the selection criteria by our partner airlines. Students will be able to apply for the flight minor when they’ve achieved Junior Student status. For courses taken at the Daytona Beach Campus, term length and availability may vary. Official copies of your polytechnic transcripts. In order for these documents to be considered official you must request an original copy from your polytechnic institution. Copy of your polytechnic diploma. Copy of your O/A level examination results. Official copies of your General Certificate of Education Ordinary and if applicable your Advanced level results. In order for these documents to be considered official, you must present to Embry-Riddle Aeronautical University the original certificates so that an official copy can be made. Students who have taken “A” level examinations are eligible for exemptions based on the subjects they’ve taken and the grades received. For a list of “A” level exemptions, please click here. Embry-Riddle Aeronautical University requires that all international students meet the university minimum requirements for admission. These requirements vary from country to country and each application to Embry-Riddle Aeronautical University is reviewed on an individual case-by-case basis. For a list of minimum entry requirements by country, please click here. Students studying in the International Baccalaureate (IB) Diploma are eligible for exemptions based on the subjects they’ve taken and the grades received. For a list of IB Diploma exemptions, please click here. Students who have taken “A” level examinations are eligible for exemptions based on the subjects they’ve taken and the grades received. For a list of “A” level exemptions, please click here. Attain a minimum score on the Test of English as a Foreign Language (TOEFL) of 550 (paper-based) or 79-80 (Internet-based). Attain a minimum score on the International English Language Testing System (IELTS) of 6.0. Earn transferable credit for a course that is the equivalent of ENGL 123 (English Composition) at an accredited postsecondary institution. Show evidence of attendance and graduation from a secondary school in which the language of instruction was English. International students should visit Singapore’s Immigration and Checkpoints Authority (ICA) FAQ website for information on the issuance of a student pass/student visa. All student pass requirements will be shared with students when an admission decision is made by the university. Official/Attested copies of documents listed above should be mailed to Embry-Riddle Aeronautical University, Office of Enrollment Management, 75 Bukit Timah Road, #02-01 Boon Siew Building, Singapore 229833. Alternatively, students may make an appointment to bring original documents in so that an official copy can be made. Only upon submission of the documents listed above will the University be able to process your application. For questions regarding program cost, contact an Enrollment Advisor at +65 6933 9580 or asia@erau.edu. If you are ready to apply, begin the application process today. Embry-Riddle Aeronautical University offers the Bachelor of Science in Aeronautics (BSA) through our newly formed partnership with ERC Institute. The ERC Institute partnership provides us with the ability to host students in a full-time and part-time classroom capacity. The Embry-Riddle Aeronautical University BSA program in Singapore is the same program offered in the United States, Europe and online, with enhancements to satisfy the unique demands of aeronautics professionals in Singapore and the surrounding regions. Students pursuing the BSA degree program at a full-time pace will take 3 courses each term. The 120 credit hour BSA degree is designed to be completed in 3.5 years. However, diploma and/or “A” level holders are eligible for a significant number of course exemptions and can expect to complete the degree program in as little as 2 years. Students pursuing the BSA degree program at a part-time pace will take 2 courses each term. The full 120 credit hour BSA degree is designed to be completed in 5 years. However, diploma and/or “A” level holders are eligible for a significant number of course exemptions and can expect to complete the degree program in as little as 3 years. Part-time students also have the option of accelerating completion of the degree by taking some courses entirely online. The cost of the Bachelor of Science in Aeronautics (BSA) degree is dependent on the number of credits a student is required to take to complete the degree requirements. Students entering the program with a diploma or GCE “A” level examination results can expect to receive a significant number of exemptions. Exemptions vary depending on the diploma and GCE “A” level subjects but most students holding one of these qualifications are eligible for between 45 and 60 credits of exemptions. A diploma holder or GCE “A” level student can expect to pay between SGD 30,000 and 48,000 for the entire degree. Current fees for the degree program can be found on our tuition page. Students entering the program without any exemptions will be required to take all 120 credits in the BSA degree. A secondary school graduate or GCE “O” level student can expect to pay SGD 63,000 for the entire degree. For more detailed information regarding program cost, contact an Enrollment Advisor at +65 6933 9580 or asia@erau.edu. A grant of $2,500 is offered for each sibling of the same family simultaneously enrolled on a full-time basis. Example, two siblings enroll at the same time, but one completes or departs the University before the other sibling, the grant is discontinued for the sibling still enrolled. Our primary intake for the BSA degree program takes place in July of each year; however, it is possible to start in January as well. A member of the Enrollment Management team can help you decide which start term works best for you. This B.S. in Aeronautics degree program at the Daytona Beach Campus combines a student’s aviation work experience with aviation courses, and general and professional development courses. This degree is housed in the Department of Aeronautical Science in the Daytona Beach Campus College of Aviation. Students can simultaneously earn a high-quality, industry-recognized, four-year degree and their flight ratings. The degree program with flight minor is approved for the Restricted Airline Transport Pilot certificate program. The FAA-approved ATP-CTP course is available to B.S. in Aeronautics students. To complete the Area of Concentration (AOC), in addition to any prior learning credit, students may select from courses in Aeronautical Science, Air Traffic Management, Applied Meteorology (aviation-related), Aviation Maintenance Science, Commercial Space Operations, Cooperative Education, Flight, Homeland Security, Safety (aviation-related), Simulation, Space Studies, or Unmanned Aircraft Systems Science. Attend classes in dynamic, aviation-related labs and facilities. The Daytona Beach Campus maintains a modern fleet of aircraft and a host of advanced flight simulation devices with advanced visual systems. Learn more about the Daytona Beach Fleet and simulators. The Campus is adjacent to the Daytona Beach International Airport, and is close to NASA and Kennedy Space Center. Students are eligible to participate in study abroad programs. The Aeronautics degree is designed specifically for students who work, have worked, or desire to work in aviation-related careers. For students with existing aviation-related knowledge and skills, this degree acknowledges a student’s valuable acquired experience through the award of advanced standing prior-learning credit. The curriculum then builds on those skills and knowledge. The program also provides an opportunity for those students new to aviation to acquire aviation-specific knowledge through aviation-related coursework. This combination of a student’s aviation learning, aviation courses, business, computer science, economics, humanities, communications, social sciences, mathematics, and physical sciences, along with professional development elective courses and a minor course of study, will prepare graduates for a career in an aviation-related field. The Aviation Area of Concentration is the degree component that lets students select courses from various aviation-related fields. In addition, the AOC portion of the degree is where credit for prior aviation learning is applied. Thirty hours of credit are needed to satisfy the requirements of this portion of the Aeronautics degree. All or part of the credit needed for this degree requirement may be awarded based on prior aviation training or experience. To complete the AOC, in addition to any prior learning credit, students may select from courses in Aeronautical Science, Air Traffic Management, Applied Meteorology (aviation-related), Aviation Maintenance Science, Commercial Space Operations, Cooperative Education, Flight, Homeland Security, Safety (aviation-related), Simulation, Space Studies or Unmanned Aircraft Systems Science. Applicants who qualify for admission to and matriculate in the degree program may be eligible for credit for prior learning. Applicants must be able to prove competence in an aviation occupation with authentic documentary evidence. Training and experience in closely related occupations can be combined. Just as official transcripts are required to transfer credit from one university to another, original or authenticated documentation of prior learning from professional training and experience must be presented to qualify for award of Aviation Area of Concentration credit. Documentary evidence must be from objective third-party sources and must clearly describe the applicant’s professional training, duties, and achievements in detail. Advanced standing credit will be awarded in accordance with the applicable Embry-Riddle Aeronautical University Curriculum Manual. Many Embry-Riddle courses are designed to teach the same skills and knowledge that Aeronautics students have acquired through experience and training. Students who complete courses in the same aviation specialty for which they were granted Aviation Area of Concentration credit would be duplicating coverage of the same subject matter. Credit for completion of such courses will not be applied to degree requirements. Credit for prior learning granted in the Aeronautics degree program may not be transferable to any other Embry-Riddle degree program. Students must select and complete one minor field of study. Total credits in the minor will vary depending on which minor is chosen. Students typically select a minor that will enhance their aviation career. Courses required for the minor field of study may be used to fill Area of Concentration, Professional Development, or Open Elective degree requirements. See Minor Courses of Study in this catalog. The curriculum to be followed by each student will vary depending on any AOC prior learning or transfer credits granted. Embry-Riddle courses in the general education categories of Communication Theory and Skills, Mathematics, Computer Science, Physical and Life Sciences, Humanities, and Social Sciences may be chosen from approved list of General Education courses, assuming prerequisite requirements are met and with the permission of the advisor. Courses from other institutions are acceptable if they fall into these broad categories and are at the level specified above in the Aviation Business Administration vertical outline. Other courses may also be used with the permission of a department chair. Students need to ascertain Mathematics and Physical Sciences pre/corequisites that are required for other courses. For example, PS 103, PS 104 and MA 112 are required for many upper-division AS and WX courses. This B.S. in Aeronautics program at the Prescott Campus is combination of a student’s learning and experience with aviation-related careers, whether in fixed wing, rotary wing, air traffic control, or other areas of aviation. The Bachelor of Science in Aeronautics degree is housed in the Department of Applied Aviation Sciences in the Prescott Campus College of Aviation.To complete the Area of Concentration (AOC), in addition to any prior learning credit, students may select from courses in Aeronautical Science, Flight, Air Traffic Management, Safety (aviation-related), or Applied Meteorology (aviation-related). At the Prescott Campus, students can earn a high-quality, industry-known, four-year degree and their flight ratings simultaneously. The BSA degree program with flight minor is approved for the Restricted Airline Transport Pilot certificate program. The FAA-approved ATP-CTP course is available to BSA students. Prescott BSA students attend classes in dynamic, aviation-related labs and facilities. The Campus maintains a modern fleet of aircraft and a host of advanced flight simulation devices with advanced visual systems. Learn more about the Prescott Fleet and Simulators. Any student is welcome and encouraged to participate in research of their choice and present their project at A3IRCon sponsored by Embry-Riddle. The Aeronautics degree is designed specifically for students who work, have worked, or desire to work in aviation-related careers. For students with existing aviation-related knowledge and skills, this degree acknowledges a student’s valuable acquired experience through the award of advanced standing prior-learning credit. The curriculum then builds on those skills and knowledge. The program also provides an opportunity for students new to aviation to acquire aviation-specific knowledge through aviation-related coursework. This combination of a student’s aviation learning, aviation courses, courses in business, computer science, economics, humanities, communications, social sciences, mathematics, and physical sciences, along with professional development elective courses and a minor course of study, will prepare graduates for a career in an aviation-related field. The Aviation Area of Concentration is the degree component where students can select courses from various aviation-related fields. In addition, the AOC portion of the degree is where credit for prior aviation learning is applied. Forty credit hours are needed to satisfy the requirements of this portion of the Aeronautics degree. All or part of the credit needed for this degree requirement may be awarded based on prior aviation training or experience. To complete the AOC, in addition to any prior learning credit, students may select from courses in Aeronautical Science, Flight, Air Traffic Management, Safety (aviation-related), or Applied Meteorology (aviation-related). Applicants who qualify for admission to and matriculate in the degree program may be eligible for credit for prior learning. Applicants must be able to prove competence in an aviation occupation with authentic documentary evidence. Training and experience in closely related occupations can be combined. Just as official transcripts are required to transfer credit from one university to another, original or authenticated documentation of prior learning from professional training and experience must be presented to qualify for Aviation Area of Concentration credit. Documentary evidence must be from objective third-party sources and clearly describe the applicant’s professional training, duties, and achievements in detail. Advanced standing credit will be awarded in accordance with the applicable Embry-Riddle Curriculum Manual. Many Embry-Riddle courses are designed to teach the same skills and knowledge that Aeronautics students have acquired through experience and training. Students who complete courses in the same aviation specialty for which they were granted Aviation Area of Concentration credit would be duplicating coverage of the same subject matter. Credit for completion of such courses will not be applied to degree requirements. Students must select and complete one minor field of study. Total credits within the minor will vary depending on which minor is chosen. Students typically select a minor that will enhance their aviation career. Courses required for the minor field of study may be used to fill Area of Concentration, Professional Development, or Open Elective degree requirements. See Minor Courses of Study in this catalog. The Bachelor of Science degree in Aeronautics requires successful completion of a minimum of 120 credit hours (typically 8 semesters). A minimum of 40 credit hours must be upper-level. The curriculum to be followed by each student will vary depending on any AOC prior learning or transfer credits granted. Students must select one of the following primary capstone course options: AS480 (aviation research) or AS490 (helicopter specialty). (Secondary options include AS410 (dispatch certification) or AS420/FA420 (Airline Transport Pilot Certificate Training Program—ATP CTP) IF the student has the required pre-requisites.) For each of these options, each student must complete the required courses prior to enrolling in his/her selected capstone course. AS 207 is a prerequisite for AS 480 and will be counted toward the 40 credits required for the Aviation Area of Concentration (AAOC). Embry-Riddle courses in the general education categories of Communication Theory and Skills, Humanities, and Social Sciences may be chosen from those listed below, assuming prerequisite requirements are met. Courses from other institutions are acceptable if they fall into these broad categories and are at the level specified in the Aeronautics vertical outline. Other courses may also be used with permission of the undergraduate program coordinator. Dependent on the amount of upper-level Aviation Area of Concentration credit applied, some of the open or Communications/Humanities/Social Sciences electives in the B.S. degree may have to be 300-400 level courses to satisfy the graduation requirement of 40 credits of upper-level courses. Students need to complete Mathematics and Physical Sciences pre/corequisites that are required for other courses. For example, PS 113, PS 117 and MA 112 are required for many upper-division AS and WX courses. When the Daytona Beach Police Department (DBPD) got the call that a man suspected of having killed one person and injured two others was holed up in an Ormond Beach motel, they assembled a six-person team trained to apprehend him. The Bachelor of Science in Aeronautics is a multidisciplinary online or on-campus degree program that combines previous work experience with courses of study in human factors, security, aviation safety, occupational safety and health, air traffic control, aircraft maintenance, and aeronautical science. The BSA at Worldwide & Online is housed in the College of Aeronautics Undergraduate Studies. Electives allow students to tailor degrees to particular interests and career goals, and is closely mapped to the career needs of the student and the demands of the industries they serve. Students can earn more than a quarter of the required semester hours from prior learning experience and receive your bachelor’s degree in as few as three years. At the Worldwide & Online Campus you can structure your education around your lifestyle, taking classes where you want and when you want. For students who choose to pursue their master’s degree, a 4+1 degree option is available. Students can strengthen their aviation knowledge, credentials and experience base by adding several minor courses of study. Graduates from the Worldwide Bachelor of Science in Aeronautics are not eligible to apply for a restricted privileges airline transport pilot (ATP) certificate. Take your future to new heights! Whether you want to launch into an aviation career, break away from the competition, or advance your current position and earnings potential, the Bachelor of Science in Aeronautics (BSA) opens the door to new opportunities in the dynamic aviation/aerospace industry. Aeronautics curriculum is closely mapped to the needs and demands of the aviation/aerospace industry and to general education guidelines. The BSA is a multidisciplinary program with courses of study in human factors, security, aviation safety, occupational safety and health, air traffic control, aircraft maintenance, and aeronautical science. Within that broad base, electives and minors allow you to tailor your degree to your particular interests and career goals. It doesn’t have to take long, either. You can receive transfer credit, advance standing, and FAA or military ratings and certifications, which may lead to receiving your degree in a shorter time. Students are also eligible to engage in cooperative study/internships and may elect to seek out those enriching opportunities. Graduates from the Worldwide BSA degree program are not eligible to apply for a restricted privileges airline transport pilot (ATP) certificate. One key and essential element of this degree is the ability to enhance and strengthen your academic program by adding any Minor Course of Study. Students may use courses from a minor and place them into Aviation Area of Concentration, Professional Development Electives and/or Open Electives (all as appropriate). Students are strongly encouraged to add a Minor to their degree. The Aviation Area of Concentration is the degree area where credit for prior aviation learning is housed or where students can take aeronautical science courses. Many students bring in all or part of this credit based on prior aviation training or experience or add a Minor Course of Study. However, shortages in the minimum credit required can be made up by taking courses in the following aviation-related disciplines: Aeronautical Science, Aviation Maintenance, Aviation History, and aviation/aerospace related coursework in Safety, Security, Transportation, Engineering, and Unmanned Systems. Transfer credit earned at accredited degree-granting colleges and universities. The recommendations published by the American Council on Education for U.S. Military training and experience, as well as training conducted by other government agencies and private organizations. Prior-learning credit established by the University for certain aviation licenses and ratings as they relate to this degree. B.S. in Aeronautics students who wish to continue on to a master's degree may enroll in the BSA-MSA 4+1 program as outlined in this program. Embry-Riddle courses in the general education categories of Communication Theory and Skills, Humanities, Social Sciences, Physical and Life Science, Mathematics, and Computer Science may be chosen from this list, assuming prerequisites are met. Courses from other institutions are acceptable if they fall into these broad categories and are at the level specified. Make up shortages with non-duplicating courses from the following disciplines: Aeronautical Science, Aviation Maintenance, and related aviation/aerospace coursework in Transportation, Safety, Security, History, Engineering, and Unmanned Systems.. Select from courses in available Minor Courses of Study or as accepted in these related disciplines, and Technology. This program is for exceptional students who are committed to continuing their education through the Master’s degree. This fast-paced program allows qualifying students the opportunity to complete both the Bachelor of Science in Aeronautics (BSA) and the Master of Science in Aeronautics (MSA) in five academic years. Students who are accepted in the BSA-MSA 4+1 program, will spend three academic years in undergraduate-level study and then, during their senior year, will be allowed to take up to three graduate-level courses from their selected MSA specialization to replace an equal number of elective courses in the BSA degree. MSA core courses cannot be selected as one of the three (3) MSA courses selected. Before selecting the 3 courses to be taken, students must confer with an advisor to ensure that the courses selected are suitable and align with their selected MSA specialization (a grade of B or better must be achieved). Upon completion of the BSA requirements, students will be enrolled in the MSA and can complete their degree in one year. In any graduate course taken by an undergraduate student, a grade of B or better must be earned. If a grade of C or F is earned in any of the courses taken in lieu of the elective courses in the BSA degree, the student will be removed from the program, have credit awarded to the BSA degree only, and may continue to complete the BSA degree. This special program will challenge students and develop their knowledge and understanding of concepts in aeronautical science while integrating their skills in aviation and aerospace applications. As a minimum, the applicant must have at least a 3.00 GPA and have demonstrated superior academic capability. Students will use the virtual forms application site to work through the application, recommendation, and approval process. Embry-Riddle’s residential Daytona Beach Campus plans a new Master of Science in Occupational Safety Management (MSOSM) degree program beginning in fall 2019 to prepare graduates for work with airlines, aviation manufacturers and many other industries. After nearly 10 years in the TV weather business, meteorologist and environmental reporter Vicki Graf (’07) has grown used to the bright lights and cameras of broadcast news. When she’s on the air, she likes to believe that she’s presenting to just the handful of crew members in the studio with her, rather than the thousands of people watching at home. That’s how she beats the nerves, she said, and it works. That’s how she feels comfortable and even natural in front of the camera — but it wasn’t always like this. PRESCOTT, Ariz. – A total of 249 students representing Embry-Riddle Aeronautical University’s Prescott and Worldwide Campuses will graduate at the University’s Fall 2018 Commencement Ceremony on Saturday, Dec. 15, at 10 a.m. at the Prescott Valley Event Center. It’s 10:30 a.m. on a Friday and Embry-Riddle graduate Dennis Jones, now the managing director of the National Transportation Safety Board (NTSB), has already put in half a day’s work, having clocked in before most people have gotten out of bed. There’s a small crowd gathered outside his office, waiting for him to wrap up our phone conversation so he can get back to the day-to-day operations of the NTSB. Prescott, Ariz. – For the 32nd year in a row, Embry-Riddle Prescott’s 12-Time National Champion Golden Eagles Flight Team won the National Intercollegiate Flying Association’s Safety and Flight Elevation Conference (NIFA SAFECON) regional competition with 13 overall first-place victories, including Top Scoring Contestant and a two-way tie for Top Pilot. All current or former military, this Georgia family challenges each other as they gain new knowledge and skills. Embry-Riddle Aeronautical University has been named among Military Times Best for Vets: Colleges 2019 rankings for providing quality educational services to student veterans and students connected to the military. At the end of a long work week as a product specialist at a Brazilian airline, Haroldo De Lima might want to stay home and relax. Instead, every Friday night, he heads out into the streets of São Paulo with a group of friends to bring food, clothes and blankets to homeless people. Embry-Riddle Aeronautical University Worldwide has partnered with Nashville Flight Training (NFT) to give future pilots a pathway to commercial pilot careers. NFT and the University are offering a degree program allowing NFT flight students to work concurrently toward a Bachelor of Science in Aeronautics while working to receive a pilot license. Soon, student pilots at Embry-Riddle will be able to practice pre-flight inspections of a Cessna 172 aircraft in the new Virtual Reality Laboratory on Embry-Riddle’s Daytona Beach Campus. Tori Kobayashi has been awarded the highly competitive Robertson / International Society of Air Safety Investigators (ISASI) Fellowship in Aviation Safety and Crashworthiness. Commercial aviation in Singapore is thriving — and nowhere is that more evident than at the city-state’s Changi International Airport. Take a stroll through any of its four terminals (with a fifth on the way) and you find symbolic reminders of an industry in full bloom. But for Alex Ong, who grew up in Singapore watching the aviation industry transform his country and the surrounding region, the real barometer of growth sits just outside those terminals: airplanes.